We offer an enchanting range of embroidered sherwanis for boys, that are hand embroidered with zari & silk thread. 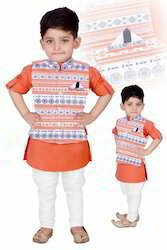 These kids sherwanis are exclusive ethnic garments for special occasions and add a glamor to the persona. It is a must for an Indian wedding collection. Backed by a diligent team of professionals, we have been able to manufacture an enhanced quality Kids Jacket. The offered Jacket is designed using extra soft quality fabric that is sourced from trusted vendors in the market and ultra modern technology in compliance with set industrial norms. We are reputed firm in the market for Kids Winter Jacket. This product is available in varied sizes and designs that meet on client’s demand. We are offering Kids Denim Jacket to our client and our product is made of good quality. Being a leading firm in this industry, we are trading a high quality range of Printed Kids Jacket. Committed towards meeting the demand of our clients we are engaged in delivering best range of Kids Jackets.